Snugglepot and Cuddlepie Fans Unite – New Gumnut Babies Collectables are COMING and You Don’t Want To Miss Out! 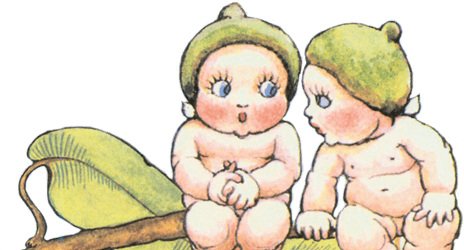 Gumnut Babies collectables have long enchanted fans of May Gibbs’ beautiful, classic books. The May Gibbs store brings you a wide range of artworks, homewares, audio books and beauty products inspired by these beloved Australian texts, with easy online ordering. Gumnut Babies collectables are treasured by Australian book fans, but it’s amazing how popular they are internationally too! These precious objects are intrinsically linked to Australiana and a simple, outback lifestyle, making them super-collectable for tourists, or Australians living overseas. Gumnut Babies collectable plates, intricate figurines, studio albums and recordings and even baby books take pride of place on bookshelves and mantlepieces all over the world. But wait! There’s something new on the horizon for fans of May Gibbs’ stories. If Gumnut Babies collectables are something you’re interested in, then you’re going to want to keep your eyes peeled for what’s coming! 2018 sees the celebration of the centenary of the publication of Tales of Snugglepot and Cuddlepie – a classic that has remained in constant print for one hundred years and delighted untold numbers of children and adults. May Gibbs’ message, “Humans: Please be kind to all bush creatures and don’t pull flowers up by the roots” has resonated across generations and inspired innumerable conservationists across the world. May Gibbs Official is planning major activities in 2018 that will see the introduction of very special Gumnut Babies collectables that fans will be desperate to get hold of. The centenary of the publication of Snugglepot and Cuddlepie will also excite audiences old and new with a wide variety of celebrations. The Banksia Men are not the only ones chasing these beautiful Nuts and Blossoms. Demand for these Gumnut Babies collectables will be high upon their release into the wild! Make sure you sign up to the May Gibbs Newsletter to ensure that you’re amongst the first to hear the rustlings in the branches when these little darlings are released to the general public. These newly issued Gumnut Babies collectables will be of the highest quality in celebration of an incredible one hundred years. We’ll share more news in the lead up to their release so make sure you stay informed about all things Gumnut. The bush telegraph tells us new Gumnut Baby collectibles are coming in 2018! Stay tuned so you don’t miss out on your little piece of Australiana. « Book Week 2018 – Let’s Make Book Week Costumes All About Australian Characters!